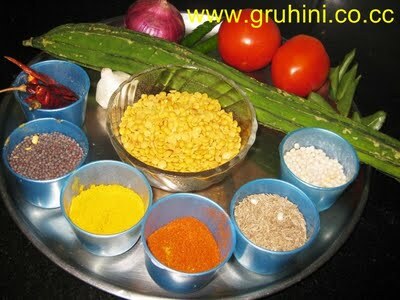 Soak 1\2 cup Thur dal in water for 10 to 15 mins. 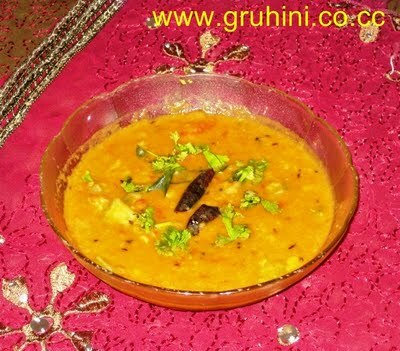 Put the dal, cut thurai pieces, cut onions, green chillies and 1 to 1 and 1\2 cups of water in a pressure cooker and cook for 3 to 4 whistles. After the pressure is gone, add salt (1\2 cup water if the dal is too thick) and boil for few mins. Take of from the flame. Take a frying pan, add 1 table spoon of oil and heat. Add rai, jeera, and urad dal let them splutter. Add red chillies, garlic cloves and curry leaves and fry. Add finely chopped tomatoes and fry until it is cooked. Add chilli powder, haldi powder and dhaniya powder and stir. Add the cooked thurai-dal to it and boil for few mins.